Sean Dyche’s Burnley over-performed so far...is their defensive approach sustainable? The famous “You are talking to me about expected goals in the Champions League semi-final they’ve just lost? What an absolute load of nonsense,” phrase coming from pundit Craig Burley contribute to highlight how much popular analytical football data became. xG didn’t appear for the first time on Match of the Day this campaign as they have been around for more than five years mainly thanks to the work of analytics experts such as Michael Caley. Right now, you can find a lot of xG models around the web using Opta’s data trying to evaluate the quality of scoring chances, in the way to determine exactly how teams are performing and where likely is that a team will be positioned on the league at the end of the season. So, data as xG are very different from statistics: the latter will tell you what happened while xG would give you a better idea about what could be yet to come. One of the most quoted example about how xG work is Juventus in 2015/16. After 10 league matches the Old Lady had merely won three times although over that 10 games span they scored fewer goals than expected according to the quality of their xG. In other words, it means they were underperforming. In fact, as their expected goals suggested, Juventus progressed, and they won the following 15 Serie A games ending the season as champions. Could the same method be applied to Burnley? 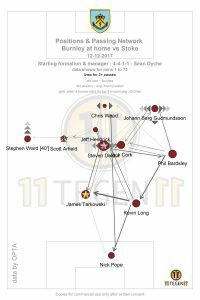 An @11tegen’s positioning and passing network of Burnley against Stoke, a match the Clarets won 1-0 despite the fact they registered a lower xG (0.35) than their rivals (0.86). Sean Dyche’s side is clearly not a possession-based team. The Sean Dyche’s team currently exceeded the expectations as they now sit sixth in Premier League. This is a big accomplishment for the Clarets and many pundits highly praised their manager. All that glitters are gold or are they overperforming? Former Burnely’s forward, Andre Gray told that “the table doesn’t lie”. Is that true or are the Clarets supposed to regress? First and foremost, Burnely are doing what they are doing mostly with their defense. They allowed only 19 goals so far. That’s third best in the league. Based on the xG against, Dyche’s side is allowing less goals than expected. In fact, they are currently 9th in terms of expected goals against with 30.11. That’s not so strange as no other Premier League side allowed as many shots per game as the Clarets (16.1) and no starting goalkeeper has made more saves per game than Nick Pope, according to Whoscored.com data. So, they are defensively overperforming. Dyche is not an aesthete and he intensively worked on the team’s defensive structure. His defenders are instructed to put opponents in a position from where is statistically hard to produce quality shots. It worked so far as highlighted by the fact that Burnley are first in Premier League in shots blocked per game (5.5). Burnley’s players are trained to put opponents in positions from where is harder to make quality shots. Dyche usually line up his team in a 4-4-1-1 formation. They are a mainly defensive-oriented side, able to defend deep and tight with two banks of four. Their backline is suited to produce clearances in their penalty box – Burnley are second to Everton in the league in total clearances per game with 33.1 – whilst their midfielders have shown their ability on occupy the zone 14, preventing opponents creating scoring chances with shots from outside the box. Defending deep has its disadvantage but also some advantages. One of them lies in the fact that defenders are close to the goal, so they can help the keeper to clear the box. Furthermore, they can put their bodies into covering positions to help Pope by reducing the width of the goal at forwards’ disposal. The aim is to prevent Burnley from conceding quality chances. Put more defenders between the shot zone and the goal can decrease the possibility of a shot to become a goal. Putting many bodies inside the penalty box gives you a better chance to make clearances. That’s an interesting parameter as seems as some analytics models don’t take care enough of the quantity of defenders between the shooter and the goal, which can affect the quality of a chance. Will Burnley be able to maintain these defensive performances or would we would expect Dyche’s side goals against rate get worse than their current rate (0.9 goals per game)? 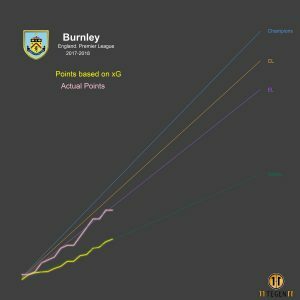 This graphic taken from @11tegen some weeks ago showed us how much Sean Dyche’s side is over-performing. Hard to say and harder to predict. That is because data models often fail to predict defensive sustainability in the long term. With usual analysis models struggling to take into account things like the number of team’s defenders on any opposite’s scoring chance or how long in a season a side can be able to maintain its defensive compactness, is hard to predict a team’s defensive efficiency on the long-range. Some pundits predicted that Burnley’s defensive production should regress as their defense has been surprisingly good so far and it shouldn’t stay there forever. Other experts added that Pope’s performances too should decrease into a more average rate – between 65% to 70% save percentage. But with these predictions we are beyond mathematical explanations. Truth is that teams’ defensive sustainability can’t ever be measured. Currently, the only reliable parameter of defensive efficiency seems to be the xGD in open play provided by understat.com. Expected goals difference (xGD) is the difference between expected goals for and expected goals against. Burnley’s xGD is -11.57 and, although this can provide us an idea on the current team’s defensive efficiency, is hard to predict if Dyche’s side will be able to maintain this rate in a longer-term. At the end, every season is marked by over-performances and under-performances, both on the offensive or defensive side of the ball. There always are teams exceeding the expectations with more points, more goals scored or fewer goals allowed than expected. If xG can help to have a better idea on the probable progression or regression of a team as the season goes on, predicting the sustainability of defensive performances is harder, although xGD can offer a starting point.